The Hukilau 2016 artwork was created by Shag. Weekend passes are now on sale for The Hukilau 2016, the 15th anniversary of the East Coast’s premiere Tiki weekender coming June 8-12 to the Hyatt Regency Pier 66 hotel and The Mai-Kai restaurant in Fort Lauderdale. For a limited time only, guests can buy 2016 passes at 2015 prices. If you buy your weekend pass now, you’re also guaranteed an opportunity to purchase tickets to several special cocktail parties scheduled for Thursday, June 9, in the 17th floor rotating ballroom at Pier 66: The second Tiki Tower Takeover (featuring Jeff “Beachbum” Berry, Martin Cate, and four more top Tiki bartenders) plus the first-ever Shag’s SkyLounge (join the acclaimed artist in a “live painting”). 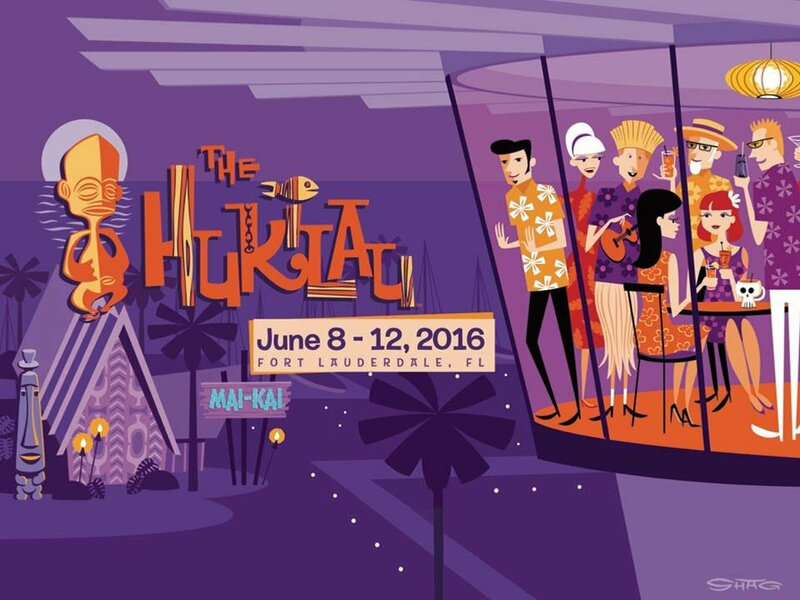 The Hukilau: June 8-12, 2016, at the Hyatt Regency Pier 66 and The Mai-Kai restaurant in Fort Lauderdale. Special guests: Shag, Jeff “Beachbum” Berry, Martin Cate, Sven Kirsten, Humuhumu, plus many more. The Hukilau’s organizer, Christie “Tiki Kiliki” White, says that weekend passes will remain at 2015 prices through the end of the year. They will increase in early 2016 when the full entertainment lineup is announced. Initially, only weekend passholders will be given the chance to buy Tiki Tower Takeover and Shag’s SkyLounge tickets, White said. These special events will sell out, so it’s advised that you act now. Also just announced on the updated website is an exclusive symposium featuring Shag, aka Josh Agle, the celebrated Tiki artist who spent his childhood in Hawaii and later moved to California. The career retrospective will be his first-ever symposium at a Tiki event, White said. 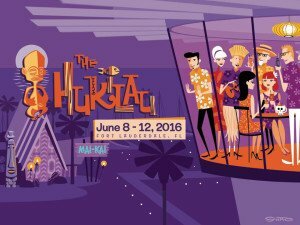 Also teased on the new site are symposium participants Sven Kirsten (author of The Book of Tiki and Tiki Pop) and Humuhumu (Tiki historian and creator of the Critiki website). Symposium tickets will be available exclusively for passholders in January, White said, another reason to reserve yours now. The Tiki Tower Takeover and Shag’s SkyLounge tickets are available now for passholders. 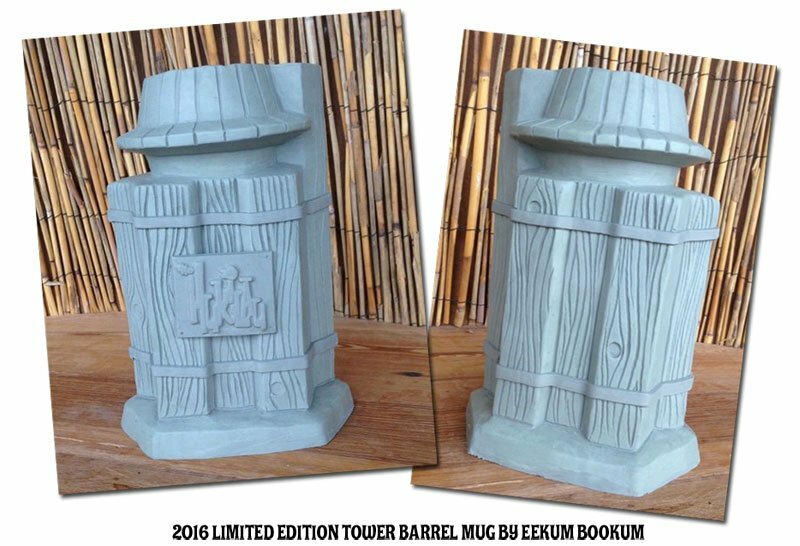 An early version of the limited-edition Pier 66 Tower Barrel Mug by Eekum Bookum. It includes two icons in one mug: The Pier 66 tower and The Mai-Kai’s Rum Barrel. White has also added an additional pass to this year’s lineup, an all-encompassing premium “South Seas Pass” ($349) that includes not only access to all five days, but also a limited-edition Pier 66 Tower Barrel Mug by Eekum Bookum, a ticket to the Tiki Tower Takeover including early entry to meet the bartenders, a ticket to Shag’s SkyLounge, and premium seating at The Mai-Kai during the June 11 dinner shows. Other passes include the five-day Big Kahuna Pass ($155), the four-day Aloha Pass ($130), and the three-day Luau Pass ($115). The special events must be purchased separately with these passes, and they don’t include the mug or premium seating. But it’s advised that you reserve your spot in the Pier Top Ballroom events now. 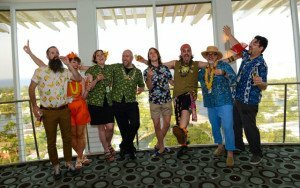 Last year’s Tiki Tower Takeover featured Jeff “Beachbum” Berry (of Latitude 29 in New Orleans), Martin Cate (of Smuggler’s Cove in San Francisco), Brian Miller (of “Tiki Mondays With Miller” in New York City), Paul McGee (of Lost Lake in Chicago) and their bar teams personally mixing up signature cocktails. This year, Berry and Cate will be joined by four additional bar stations, bringing the total to six. Tickets ($69) include all six cocktails, hors d’oeuvres, entertainment and the one-of-a-kind experience. It runs from 5 to 7 p.m. on June 9 (4 p.m. for South Seas passholders). That same evening, the ballroom will be transformed into a swank mid-century paradise for Shag SkyLounge, a “Martini meet and mingle” with the artist featuring spectacular night views and live Bossa Nova tunes. Dress in your retro finest and relax in the mid-century modern furnishings. There will be a “Dress As Your Favorite Shag Character” contest with special prizes. The ticket ($49) includes one complimentary Martini, entertainment and an unforgettable experience. The Pier 66 tower was added to the hotel in 1965 and remains a Fort Lauderdale landmark. It looms above the south end of Fort Lauderdale Beach and Port Everglades, one of the country’s busiest cruise ports. The hotel dates back to 1956 and was built by Phillips Petroleum, which explains the “66” moniker. The vintage property includes many unique nods to that history. For example, the Pier Top Ballroom rotates 360 degrees once every 66 minutes. Exclusive rates for The Hukilau at Pier 66 are $129 for marina/pool view rooms, $149 for tower rooms, and $169 for tower junior suites. All rates are based on double occupancy. Only those staying at Pier 66 will receive The Hukilau’s welcome bags full of sponsor donations given to attendees each year. The Hukilau will also be paying tribute to The Mai-Kai in 2016, kicking off a celebration of the restaurant’s 60th anniversary. The event mug will honor the acclaimed Tiki palace, and special symposiums and presentations will be offered. 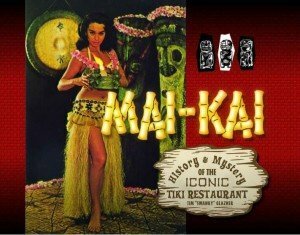 Named last year to the National Register of Historic Places, The Mai-Kai was also recently honored as the best Tiki bar in the world by Critiki.com users. Wednesday’s opening night night party, Saturday’s main event and Sunday’s finale will all take place at The Mai-Kai. The Hukilau 2015 was the debut of Pier 66 as a host venue, and it was later voted by guests as their favorite of all the Fort Lauderdale Beach hotels. 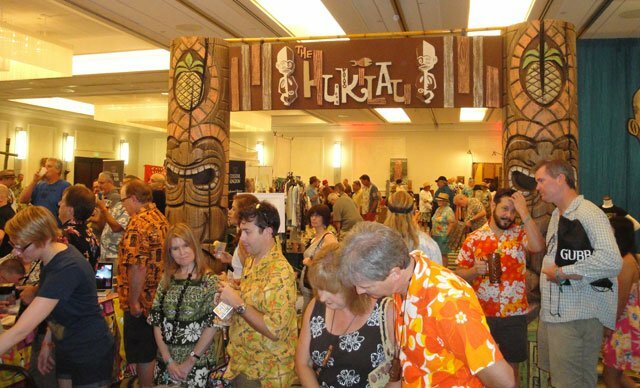 The June 10-14 event included a crusise with Dawn Wells of Gilligan’s Island, vendors and rum samples in a large ballroom off the tower lobby, plus educational symposiums and live entertainment in a dockside ballroom that included the Alika Lyman Group, The Intoxicators, Gold Dust Lounge, King Kukulele, Marina the Fire Eating Mermaid, Kevin Kidney and Jody Daily, plus many more. In an email sent Tuesday to The Hukilau mailing list, White promises “more rum, more cocktails, more symposiums, more music and special events” in 2016. Look for the 15th anniversary event to take the vintage Pier 66 and Mai-Kai experience to a new level. This entry was posted in 2016, Art, Cocktails, Culture, Events, Events, Events, History, Hukilau, Mai-Kai, Rum, South Florida, Tiki mugs and tagged Beachbum Berry, Fort Lauderdale, Hukilau, Humuhumu, Mai-Kai, Martin Cate, Pier 66, Shag, Shag’s SkyLounge, Sven Kirsten, Tiki Kiliki, Tiki Tower Takeover. Bookmark the permalink.